Welcome to our latest installment of the denim docket, where we’ll be sharing the newest jean styles that launched each month. We’ve reached out to a handful of our favorite denim brands to find out what they’ve been up to the past month and the style they are most excited about. Consider this your go-to for the freshest silhouettes, washes, and technology happening in the denim world. From fresh hues to the coolest new NYC-based brand, below you'll find the best recently launched denim styles. Whether you're looking for an on-trend pair for the season or a new staple you can wear on repeat to the office, we have a selection for everyone. With prices starting at $89, we guarantee you'll find your next pair of jeans. See and shop the styles that debuted over the past 30 days. "Introducing our latest addition to our vintage-inspired classics and a sure new brand favorite, the Annina. This new Citizens of Humanity women's style features a high rise and wide leg with quiet '90s references. 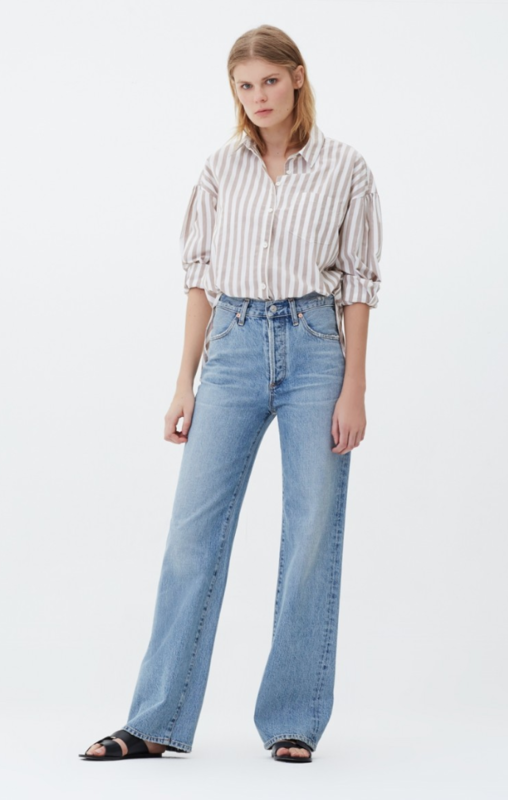 With a growing interest in wider-leg, trouser silhouettes in denim, the Annina is important from a directional point of view and a must-have for the spring season," says the team at Citizens of Humanity. "The Sacha is a wide-leg crop with a high rise," CoH continues. "This fit is crafted from non-stretch denim, making for the perfect fashion jean for the season. Currently available in three washes for spring, including a pale blue, blue-and-white-striped wash, and a vintage light blue with subtle fading." The white stitching on Cotton Citizen's classic cigarette jeans is sure to be a street style favorite at New York Fashion Week. Jordache is making a splash in the fashion circuit right now with several celebrity sightings and a fresh new debut of spring styles. Along with the vintage-style fit, I'm particularly loving the blue PVC label. A playful pair of skinny jeans to add to your denim collection. They'd particularly make for great vacation jeans if you're going somewhere with a nautical vibe. "Raven is our ultra-high-rise, acid-wash-splatter jean. Each pant is split in half, acid-washed by hand, and then reconstructed in NYC using vintage denim," says the CIE team. If you're on the hunt for a way to freshen your go-to skinny-jean look, try a high-waisted style with exposed buttons like this new arrival from Seven7. Grlfrnd's long jean shorts are the perfect way to kick-start your denim collection for spring. "Fashion-forward women are embracing wide-leg jeans this season. The Joan is a directional high-rise fit with a wide leg that is fitted at the hips. In a white, rigid denim with soft, light gray stitching to add a hint of contrast, this is a rigid denim jean, and we highly recommend sizing up. As with any rigid product, this style takes some time to be worn in, resulting in a fit that's customized to your body," notes J Brand. "A cropped cigarette trouser with a high rise, button fly, and utility details. Comes with a coordinating tie-waist belt. In our Luxe Twill fabric, which is lightweight and soft with a dressy feel," says the J Brand team. We can always count on Reformation to serve us with a solid high-rise fit each season. We're taking notes from Levi's styling here and replicating this denim-on-denim look with its new boot-cut jeans stat. "An essential high-waisted vintage skinny ankle, these ankle-length skinnies are sleek with the most flattering rise. Constructed with stretch for an optimal overall fit and lasting comfort," the AG team explains. Up next, shop the new wave of It shoe brands.